Tags: boston, if, if month, interactive fiction, pr-if, tufts. Creating Interactive Fiction with Inform 7, by Aaron Reed. Cool-looking book, eh? It's been out for a few weeks, and I haven't seen a review beyond short "this book is awesome!" posts. I finished reading it last week. I ought to write a review. This book is awesome, and... hm. What is it? Hm. Okay, what isn't it? Continue reading Creating Interactive Fiction with Inform 7. Tags: aaron reed, books, if, inform, interactive fiction, programming, reviews. Aaron Reed’s book is out, so we’ll probably discuss it some. The Tufts University IF month is coming up (October), and various of us are helping out in various ways, so we’ll probably discuss that. And, as usual, we’ll likely just yammer on about IF in particular and games in general. Everyone is welcome, no matter your experience level with IF. If you have something particular you’d like to discuss or share with the group, feel free to do so. Note that we also have a mailing list, which is linked from our website. 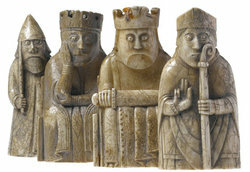 Via the New York Times’ “Gambit” chess blog, we learn of a new controversy surrounding… well, not so much a very old game as a set of very old game pieces, with new evidence causing some to question the national origin of the celebrated Lewis Chessmen. But really, I just wanted to take the opportunity to mention these extraordinary game pieces on this blog. Even though they’ve been known to the modern world since the 19th century, I first learned about them only some months ago while kicking around Wikipedia. While they like look like the whimsical work of a modern sculptor — at least to my unschooled eye — they were actually carved some 800 years ago. I showed pictures of these little guys to a friend this morning, one who actually does know something about art history. She tried to add a little perspective to my astonishment, noting how a lot of medieval artwork looks comically cartoony by modern standards. But while she spoke, all I could think was: boy, I’d love to just reach over and pick one of these pieces up. I recognize intention in their squat, chunky shapes: they were made to thunk down on the board, decisively. I bet they make a really satisfying sound when that happens. A piece that should be a knight could simultaneously also be a queen, a pawn or something else. The player doesn’t know what the second state might be or which of the two states the piece will choose when it is moved. Like a lot of geeks, I’m enamored with the twisty little passages that represent quantum physics (or at least the closest representation a layman like me can grasp). But even moreso, any science that can plug itself into a cultural foundation of gaming to produce wacky chess variants is my kind of science. Tags: board games, chess, chess variants, computer games, games, history, links, variants. The last PR-IF playing event was very successful, so we’re trying it again, this time with a more modern piece of interactive fiction: Lost Pig. Come join us this Sunday, September 12, from 2-5 pm at MIT in Building 1, Room 135. For more information, including live stream information, check out the PR-IF website.